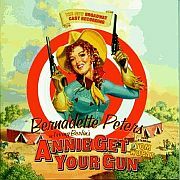 Annie Get Your Gun was a musical based on the life and loves of Annie Oakley,a famous western cowgirl in real life who was a crack shot with a rifle. This stage play and movie were played in 1946, and all songs were written the same year. All lyrics and all music was composed by Irving Berlin. The movie starred Howard Keel and Betty Hutton. Oklahoma was another outdoor Western Broadway musical that became a huge hit. It was a western, yes, but with an upbeat plot and magnificent music, unlike other common westerns. All of the popular songs from this production were composed in 1943. The movie starred Howard Keel and Shirley Jones. Both of these Broadway Musicals with a Western flair will entertain you for hours with their unique story lines and upbeat humor.